Noko's Basecamp integration will sync new project names from your Basecamp account, as well as automatically archive projects in Noko when you archive them in Basecamp. You can connect to Basecamp and Basecamp Classic accounts. Note that this integration will not import any time tracking data from Basecamp Classic (to import time from Basecamp, use Noko's CSV import feature). Click Integrations & Imports in the green navigation sidebar. 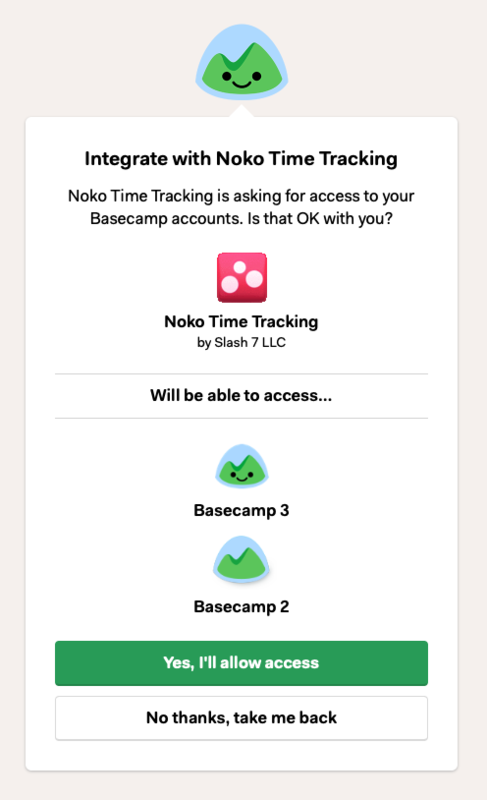 Allow Noko to access your Basecamp account by clicking the green Yes, I'll allow access button. If you're already logged into Basecamp, Basecamp will ask you for permission to allow Noko to access your Basecamp or Basecamp Classic account. If you're not already logged in to Basecamp you'll be asked to log in first. 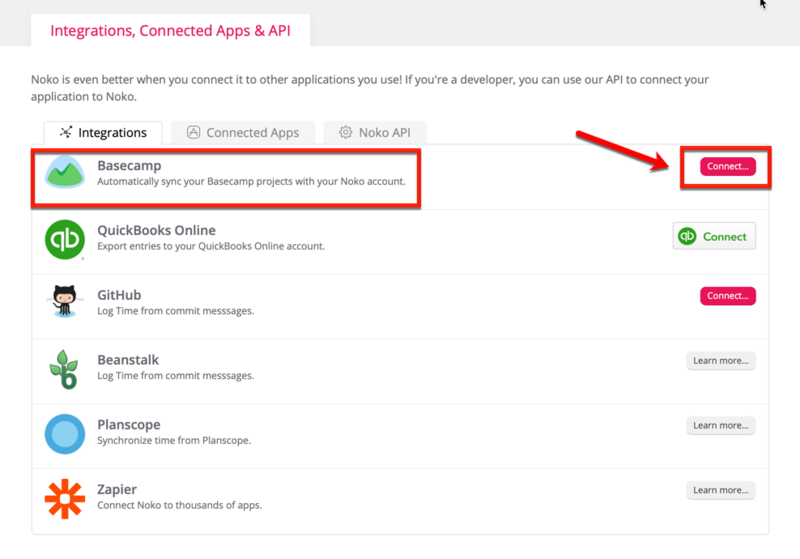 Noko will either connect you to your Basecamp account, or if you have multipe Basecamp accounts, Noko will ask you to choose the account you want to connect to. Syncing happens automatically but you can choose to to manually start a sync (though that probably won't ever be necessary). Once the syncing is complete, you'll see what projects were synced to your Noko account. If we can't sync to your Basecamp account (for example, if it got cancelled, is unpaid, or if you revoked access) we will send you an email to let you know, so you can reconnect again if necessary. 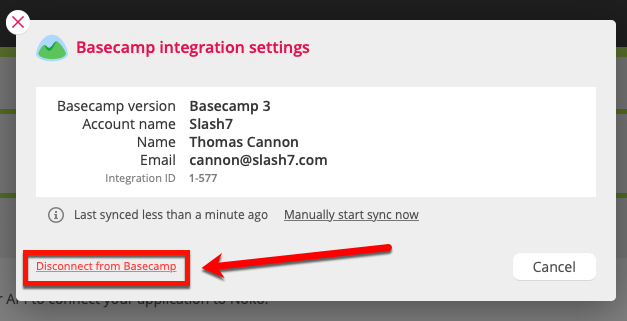 You can choose to remove the integration by going back to the Integrations & Imports page, and then clicking Edit settings… for your active Basecamp integration. In the dialog box that shows up, click on the red Disconnect from Basecamp button to disconnect and stop syncing. 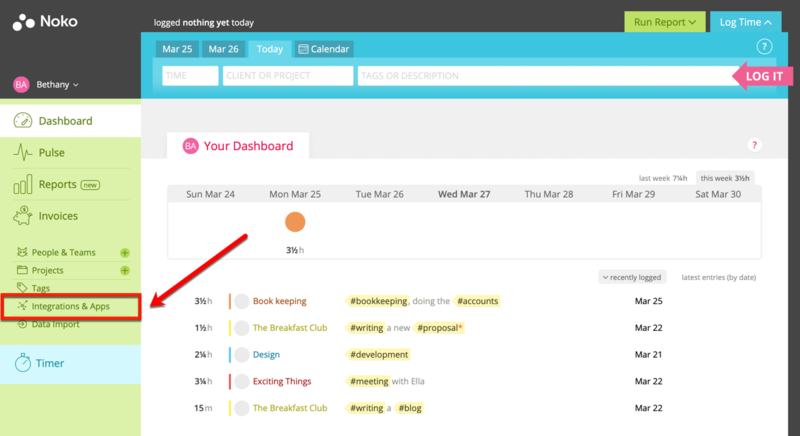 Any projects synced over from Basecamp will remain in your Noko account.